The lack of definition is a common defect in terms of when to photograph the falls from the hands and also the camera of my smartphone. You can try to eliminate or minimize this disadvantage of the photo using any graphics editor. In Adobe Photoshop, there are a couple of ways, the easiest of which is to apply filters from the group of "sharpening". Run the GUI editor, and then load the desired picture. Create a duplicate layer containing the original image. Copy layer by clicking the right mouse button on its row in the layers panel and selecting "duplicate layer", or simply pressing ctrl + j. Open in Adobe Photoshop menu section Filter, and in this subsection "sharpening". Select "Smart sharpen..." - this paragraph reveals the version of the filter with the most complete set of options. Check the box to "Advanced" to add to the main settings two tabs ("Light" and "Shadow") that contains the installer for the brightly-lit and shaded elements of the picture. Pick the most effective settings on the tab "sharpening" by moving the sliders in the fields of "Effect" and "Radius". The impact of changes to the image quality control image preview in the same window. Check, how will it affect the sharpness of your photos by applying filters from the drop-down list "Delete". Switch to the tab "Light" and using three sliders to adjust the settings on the tab "sharpening", for areas with enhanced brightness. Then do the same on the tab "Shadow" to dark areas. Click OK, and the graphics editor applies the enhancement filter definition image to a layer with a duplicate of the uploaded photos. Try alternatively to use other filters from the section "sharpening" - they use the same methods of sharpening, but have more narrow ranges of settings or only apply to certain areas of the photo. To do this, create another duplicate of the original layer, as described in the second step, and experiment with it. 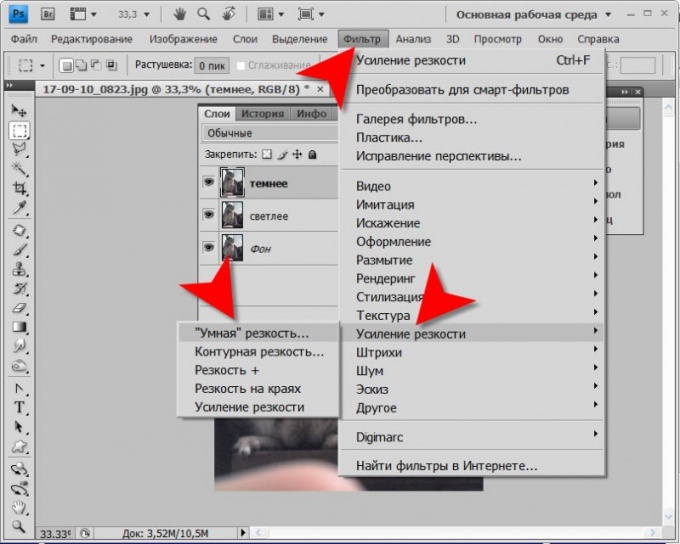 If necessary, this layer can be removed by right-clicking and selecting the menu item "Remove layer". Save the photo with the changes. To call up the save dialog you can use the ctrl + s key combination. If you want to first optimize the image (to choose the optimal ratio between image quality and file size), use the combination shift + ctrl + alt + s.
Often very interesting frames have to remove due to the fact that they blurred. At the moment the shutter of the photographer hands trembling almost imperceptibly, and this can lead to smearing and blurring. But you can correct this problem by using Adobe Photoshop. Using simple tools, you'll save the, and you don't have to put in the basket. The easiest way to fix the lack of definition of those who use digital SLRs and shoots in RAW format. Open the picture in Adobe Camera RAW (plug-in photoshop for working with images Rav-format) and move the Clarity slider to achieve the desired result. This will give the General appearance of the photo more definition. Do not overdo it, since too increasing this figure, you risk to make a photo rough. Additionally, in the next tab, you can slightly move the slider of "Sharpness". This tool makes it more clear fine details such as hair, iris of eyes, etc. But remember that increasing the sharpness, you can increase the noise. So try to find a balance between these two indicators. Those who shoots in JPG format, you can use the tools "sharpening" in the menu "Filter" of the program Adobe Photoshop. In this group there are five tools. It is difficult to say which of them you better use it. Try each of them to apply for a new copy of the original layer, and then choose the most attractive to you. Another way to increase the clarity of the picture is the use of the filter "Color contrast". Create a copy of the original layer and select it. Select the menu item "Filter – Other – Color contrast". Displays filter settings window. Drag the slider to your desired location (I recommend to do several layers with different settings, then to select the best of them). Change the layer blend mode to "Overlay", "Soft light" or "Hard light". Adjust the layer transparency. Your image was not only sharper ,but also more colorful and contrasting. The increased definition gives the details of the image sharpness, the picture becomes more "professional". But keep in mind that poor-quality picture will allow you to get a perfectly clear picture. To improve clarity on some small stations use the Sharpen tool in the sidebar. It looks like the figure of a triangle. If you do not see this icon, find the drop, or a hand with an elongated thumb are tools of the same group. Click on any of them, right-click and from the drop down menu you will see a triangle. Activate it by pressing the left mouse button. In the top bar, open the Brush option and select the diameter, hardness and shape of the brush. Adjust the blend mode (Mode) and the degree of the effect of Strength. Brush over the target areas. Open the Filter menu. Select any of the filters of direct action: Sharpen, Sharpen Edges, or Sharpen more. After selecting any of them you will immediately see the result, which can automatically give the command. Try to apply all filters at a time. You can also re-select any of the filters, which also will affect the picture. For more efficient work use tools for fine-tuning Smart Sharpen or Unsharp Mask. Select one of them. The first is the same effect on the whole image, the second more on the areas with a significant difference in colors of neighboring pixels (contours). Put a tick in the square Preview, then you will immediately see the result. In the filter window with the mouse, move the image to better see important objects. 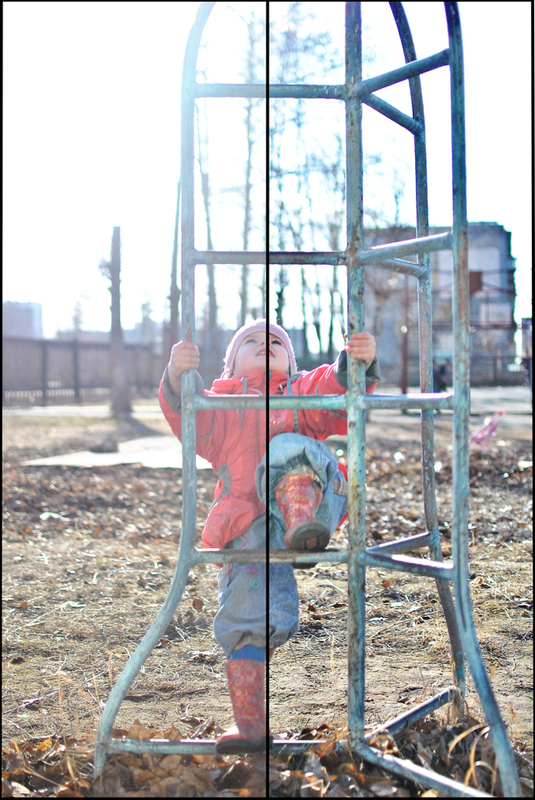 Change the Amount parameter, which determines the enhancement of contrast between pixels. Usually, optimally from 100 to 200%. Move the Radius slider to determine the width of the comparison tones. For individuals this rate is usually set from 1 to 3. In the Smart Sharpen box in the Remove specify what kind of blur you want to remove, and put a checkmark in the box More Accurate. In the Unsharp Mask Threshold parameter set from 2 to 8. Work with sharpness on the image in real size and resolution. Otherwise when you change these settings, the result can be distorted. Abuse of the sharpen filters leads to the effect of "posterization" when a reduced number of colors, and the image becomes grainy or look like a hand drawn poster. Any tool you can apply to the entire image and to its individual parts (you need to pre-allocate them). All the parameters mentioned about, they need to be set empirically for each image and follow the current result.